If you want to look at a cigar that is quite conflicting in its initial appearance, let me introduce to you, the Ashton Aged Maduro Cigar. Despite its very, very dark appearance via its extremely limited Connecticut Broad Leaf wrapper, it actually has a rich and natural sweet flavor. One may expect due its dark color, that this would be a very strong smoke, but that isn't the case with this cigar. Ashton Aged Maduro Cigars take on a whole new flavor once lit, reminiscent of a Tawny Port with its rich and nutty notes. 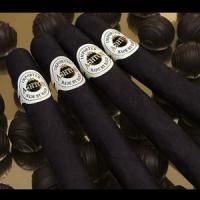 Having received an '89' from Cigar Aficionado for the Aged Maduro #30 in 2010, this cigar is sure to impress.